Leslee's Creative Inspiration: Get your MOJO on! I played along with the Mojo Monday Sketch #96 (last week's sketch challenge). You can check the sketch out HERE! There is a new sketch every Monday for you to get your mojo going. There are some awesome sketches and the 'mojolicious' Mojo Makers always have some awesome samples for us to draw inspiration from. Once again, I was playing around with my new From the Crypt set and Cast-a-spell DSP. I'm gonna have to move this set way off of my desk because it is all I seem to be reaching for. This was a fun sketch to use and it just begged for designer paper on the three panels. 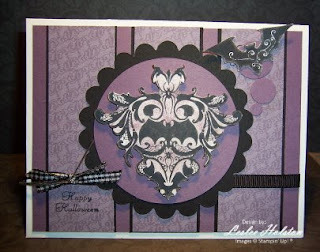 The scallop circle is die cut with the Big Shot and the Scallop Circles #2 die. The Perfect Plum circle is cut with the Circle Scissor Plus. The focal image is tediously trimmed (I don't think I'll do that again) and is sponged with Perfect Plum. Once again, I will warn you to use the StazOn Jet Black ink...unless you want it to smudge. Please don't ask me how I know this. The ribbon treatment is black grosgrain with a snip of black gingham and silver cord knotted around it. Who says we can't mix and match ribbons? One last note of interest...see the three punched plum circles in the upper right corner? Well, I'll admit it (although if I don't, no one would know), they are covering up an ink smudge. Yet, I like the graduating circles (1/4" to 1/2" to 3/4" under the bat). It makes it look as if the bat just flew out from behind the scalloped circle. Okay...so you really have to use your imagination on that one. Thanks for stopping by today! I hope that next time you are in lack of mojo you'll give the Mojo Monday Sketch Blog a try.